Can you picture him or her – that kid who’s already driving you crazy? The incessant talking, the attitude, the disrespect. Ugh, you may be thinking, it’s going to be a long year! For some reason or another, we teachers always seem to be blessed with a kid or two who try our every patience and get on our last nerve. Yes, I said blessed. And I actually don’t mean it sarcastically. Often the student who begins as our biggest frustration turns into our greatest blessing. I remember one student who seemed to have made it her goal to frustrate me as much as possible. Her attitude was on display in various forms which included running full force into me every chance she got. Or, we would be in the middle of discussing why she wasn’t supposed to write a poem about a toilet, and she would just walk away mid-sentence. I felt like giving up, but the next year things slowly began to change. I noticed less and less attitude, and I soon realized I hadn’t had a problem with her in weeks. Before long she was smiling, respectful, and came by my room just to talk. By our third year together, she had matured enough to tell me, “I can’t believe I acted like that. What was I thinking?” Since then she has truly been a delight to teach. Not every story ends this way, but God has called us to impact each student as much as we can. So don’t be discouraged, and don’t give up hope. Our God can do amazing things. 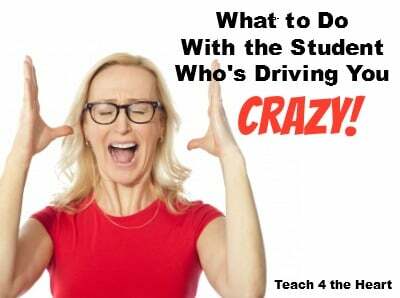 When a student is driving you crazy, don’t start building up a wall of defense. Try these ideas instead. Love them. We know we are called to love our students, but it’s not always easy. What we need to remember is that love is a choice, and true love is given even when it’s not deserved. God loves us even though we are undeserving, and we must do the same for our students. Pray for them. Praying for a student accomplishes two things. Obviously we are praying that God will work to change their heart, but God also uses our prayers to change ours – to give us a love that we didn’t think we could have. Pour into them. Be intentional about showing them you care. In The 7 Habits of Highly Effective People , Stephen Covey gives the metaphor of an emotional bank account. If we are going to be making lots of “withdraws” in the form of correction and discipline, we need to be making plenty of “deposits” by encouraging them, complimenting them, and showing them we care. Find out more about them. Talk to their former teachers and parents to try to discover what makes them tick. Is there a particular challenge that they are facing? What do they enjoy? What helps them succeed? Talk to them. Talk to them as often as possible. Yes, you will need to talk to them about their attitude and behavior but also find time to ask them about their interests. During these conversations, try to do more listening than talking. They probably don’t need another lecture, and you’ll find out better how to help them by truly hearing what they’re saying. Seek advice. If you’re at your wits’ end, seek advice from a fellow teacher or administrator. Our Christian Teachers’ Discussion Group is designed to help with challenges just like these. Be consistent. Don’t lower your standards or let them get away with misbehavior. Be consistent in your expectations and your follow through. But show them you care every step of the way. Be patient. Sometimes we forget that growth takes time. Our students are works in progress, and we should never give up on them. This course of action not easy, but it is powerful and rewarding. Try it and see what God will do. And if you’d like more help figuring out how to truly connect with challenging kids and create a classroom environment where students are respectful, responsible, and engaged, consider joining us in Beyond Classroom Management. I love your site and podcasts! They definitely remind and assure me that it’s just not me. Thank you so much for providing them. May God bless you? ?✝?